Will it be the "Pillow Revolution" or the "Jeans Revolution" for Belarus? 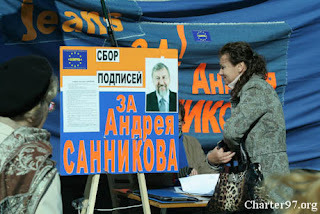 “Jeans for freedom!” civil campaign and well-known Minsk citizens have supported Andrei Sannikov. Today in the centre of Minsk near the state department store (GUM) a “jeans picket” took place. Young people with blue scarves were holding a huge banner with the words: “Jeans for Andrei Sannikov!” Stands with the portrait of Sannikov were mounted beside, and young people started actively collecting signatures in support of “European Belarus” leader. Minsk dwellers of different ages, from young to elderly people, were coming to us, giving their passports resolutely, and signing their names. Sometimes a queue was formed. No one hesitated whether to give a signature. It is obvious that people are so tired with the current regime, that a realistic candidate for the presidential position offers hope to them, make them mobilized, to start changing the situation in the country at last. Well-known persons have come to give their signatures to Andrei Sannikov: leaders of Belarus Free Theatre Mikalai Khalezin and Natallya Kalyada (Natalia Kolyada), a deputy of the “chamber of representatives” o the 2nd convocation, General Valery Fralou, the chairman of “Just World” party Syarhei Kalyakin. “I have come to support my friend, who is a candidate for presidency. Moments come when you should support a person day and night. I see that many people come here and say that they want to stand by Andrei Sannikov now. It is real support. Now pioneers and pensioners who had been forced to come, who are threatened by eviction from hostels and by other methods forced to love their “leader”, but real solidarity.